I may have exaggerated slightly at first - it's perfectly possible to read without the Kindle's features. In fact, I mainly prefer to do so: there's a certain something to owning a physical book; a kind of tactile pleasure. Especially - I have to say - an older book, which are simply lovely. (Excuse me while I stroke this embossed cover... Ahem). Still - Kindles have one main advantage over physical books: they're practical. No longer do I have to break my back, lugging my Neal Stephenson tomes to Canada! No more! Okay, whoever's done this is clearly using the Twitter feature instead... But there's a highlight going on! At any rate, this initially seemed uninteresting - I don't use highlighters in real life, let alone in books (vandalism! :P ). But when I realised that highlighting a passage saved it to your clippings, I discovered a monster the best quotation tool in history. ...Maybe I'm exaggerating. But if you're anything like me, you love those 'wham lines': George RR Martin does them a lot, too. But I never remember to write my favourite quotes down, and for a reviewer, that has to be a sin (or something very like it). This tool is brilliant, and I've already highlighted a few choice passages in Swift. ...I thought it was a joke - but it isn't. Being able not only to save those juicy quotes, but to type them directly into a blog post? 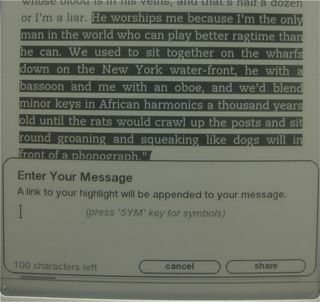 From the Kindle? For free? Heaven. Especially since the free 3G enables you to do so anywhere. Admittedly, it isn't perfect - and the battery life goes downhill. But if you're in a hurry, this is perfect. I did know about Project Gutenberg before - but did you know that you can download ebooks directly through your Kindle's browser? That might sound like advertisement, but seriously, it's really useful - gets round the trouble of a USB cable entirely. My personal favourite is, oddly enough, the contemporary reviews section of Project Gutenberg. Pretty much what it says on the tin - reviews of books when they were released, which are very interesting to read (and remarkably insightful). I only wish I could write as engagingly as these predecessors! Oh, and in other news: my latest monthly columns at at Grasping For The Wind, here - this time, on the magic system in A Song of Ice and Fire. Any thoughts - or thought of another feature of quirk you'd like to pass on? comment and tell me below! lol, lugging Stephenson tomes. I always take those on carry on cuz they put my checked bags over the 50 lb limit. the highlight thing is pretty cool, I'm always forgetting to write down the good lines for reviews. Sometimes I'll write down the page #, but being able to direct cut/paste is pretty sweet!! I'd seen something somewhere recently, probably on twitter about packaging physical books with the download code for Kindle/Nook, so you get both for just a little more $$ than buying the physical book. Hehe, good point. I broke my allowance going to Canada with Anathem. Yes, I certainly thought so - I almost never include quotes ATM (can never remember where to find the things!). Actually, I think someone was telling me about that: sounds like a pretty good idea, because I prefer owning a physical book, but for holidaymaking, not breaking back, etc... Kindle's more useful. Do you use an ereader, by the way?